Day 7 was Safari day! We were all very excited to spend a day in Lake Nakuru National Park as our treat day after a very busy week. The scenery and views were simply stunning. Vast savannah stretched out for miles around beautiful Lake Nakuru. Throughout the day we saw impala, zebras, baboons, rhinos, giraffes, water buffalo, warthogs and ostriches. Sadly no lions though! Today reminded us of the beauty within Kenya: idyllic scenery teamed with so many incredible animals. After the safari, Emily, Joy and Ray went to visit Lawrence, the oldest of The Doxa Project’s sponsored children. Lawrence’s bike kept breaking and he couldn’t travel to school, so they presented him with two new bikes for Lawrence and his brother. Lawrence was beaming when he received the bikes knowing he would now be able to access his education again. As it is our final day we thought we would share some highlights from our week here in Kwa Murugi. 1. Milka, the lady with HIV, sums up for me what The Doxa Project is all about: someone in need who has now been given hope for the future. I am excited to hear how Milka’s life pans out with the influence of The Doxa Project. 2. The launch of the sanitary towel project was huge and has been one of our biggest successes this week. 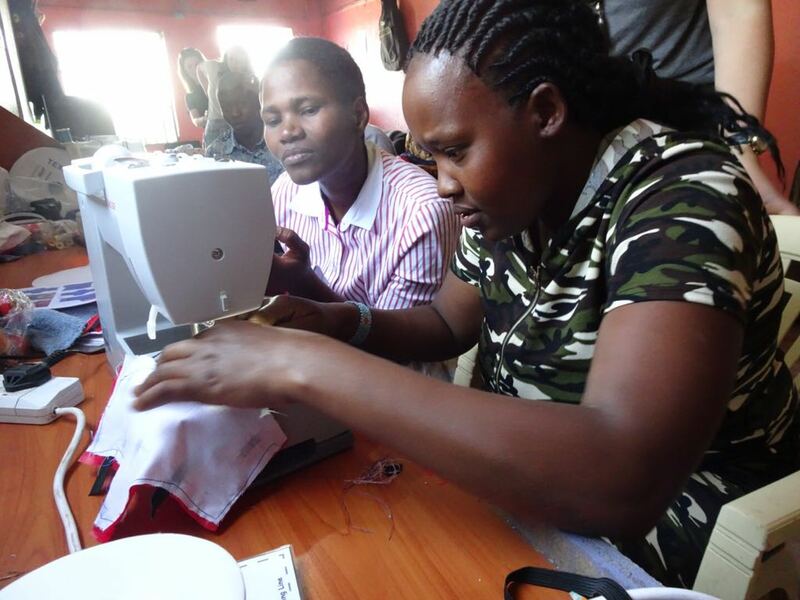 It was wonderful to see how the ladies in the Doxa office picked up the skills so quickly and were so keen to come and learn. 3. Our time at the Women’s refuge was very special and we will all look back fondly on our time spent with Esther and the team there. Again, it was exciting to see the ladies so interested in the sanitary towel project and to understand something of the impact it is going to have on them, as well as their families. 4. It was so satisfying to spend time monitoring the water filter project and seeing the progress many of these families are making. 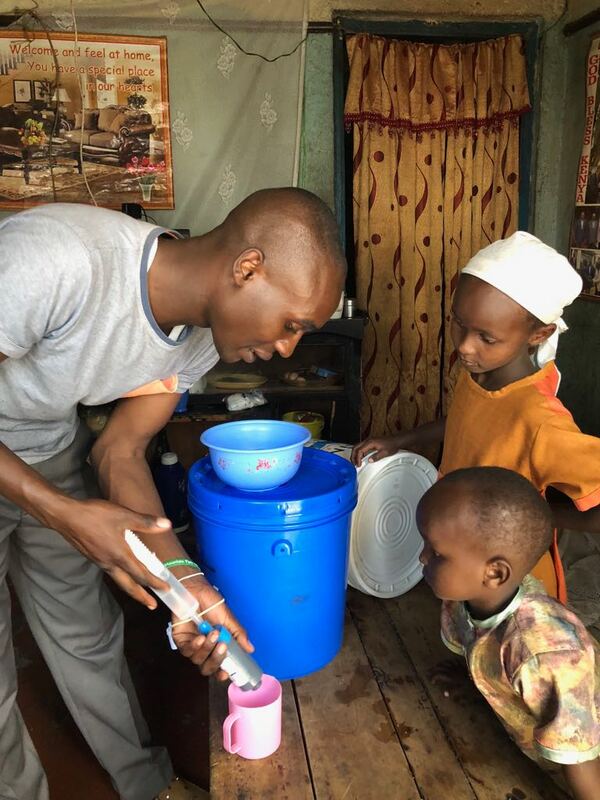 Sam was able to visit one of the homes where his wife Nicola had visited three months ago to see first hand the impact of a water filter. 5. We brought with us 100 pairs of the ‘Shoes that Grow’ and it was a privilege to begin distributing them to those who needed them. 6. 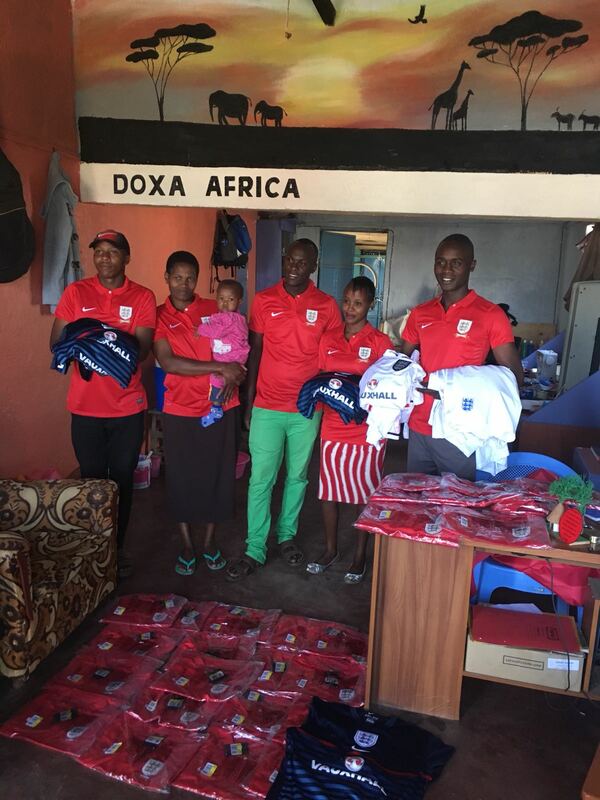 It has been amazing to see the Doxa Africa team in action, observing their sharp minds and constant hard work and seeing the massive progress since the last visit three months ago. 7. Each day we enjoyed meeting the slum families at the office and it was great to chat to them and learn their names and hear a little of their lives; everyone was so kind and welcoming to us and it was a privilege to be able to spend time with them. 8. Every evening we would sit down together as a team and debrief on the day’s activities. We were often working on different projects throughout the day, so it was good to share progress as well as pictures. One way in which we did this was through a ‘photo of the day’ competition which brought out our competitive natures and different winners were crowned each night. As a result of our photo success we have decided to launch a Doxa calendar which will be available to purchase before the end of the year! In the evening, we were treated to a dinner of mbuzi, (goat!) which had been prepared by the hotel owner especially for us. He was honoured to have us stay and serving guests a goat is a big sign of respect, so we were really grateful and enjoyed our last evening in Nakuru with our Kenyan friends. If you have enjoyed reading the blog and feel moved to support the work of The Doxa Project, they are urgently needing more regular monthly sponsors which can start from as little as £10 a month. Please visit thedoxaproject.org for further information.